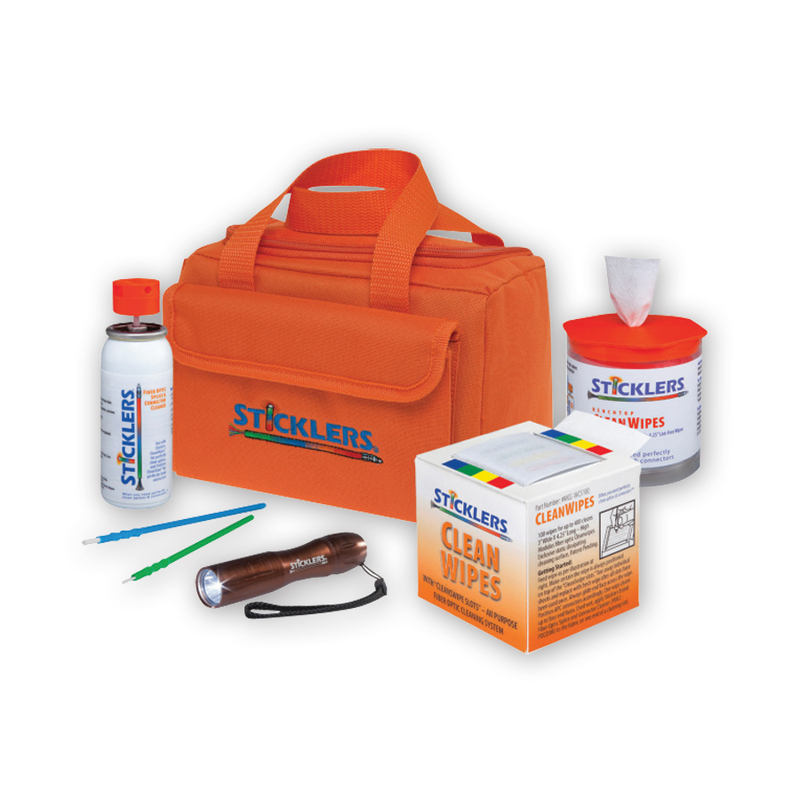 The Sticklers Fiber Optic Cleaning Kit by MicroCare Corporation has everything you need to clean 800+ fiber end-faces quickly, reliably and inexpensively. 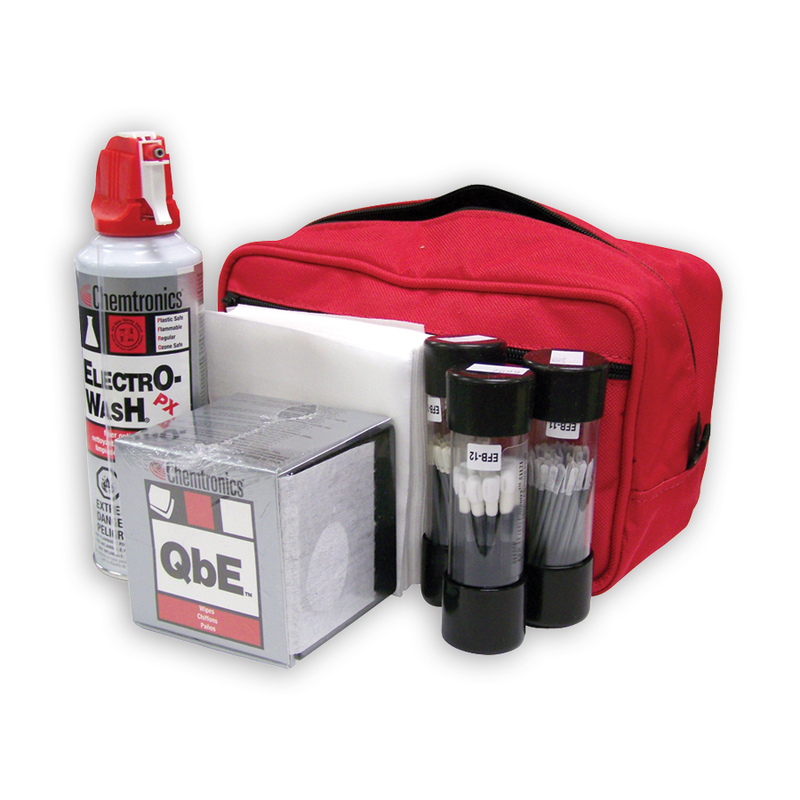 Each kit features the unique Sticklers™ nonflammable cleaning fluid that eliminates time-wasting re-cleaning and minimizes expensive repair call-outs. 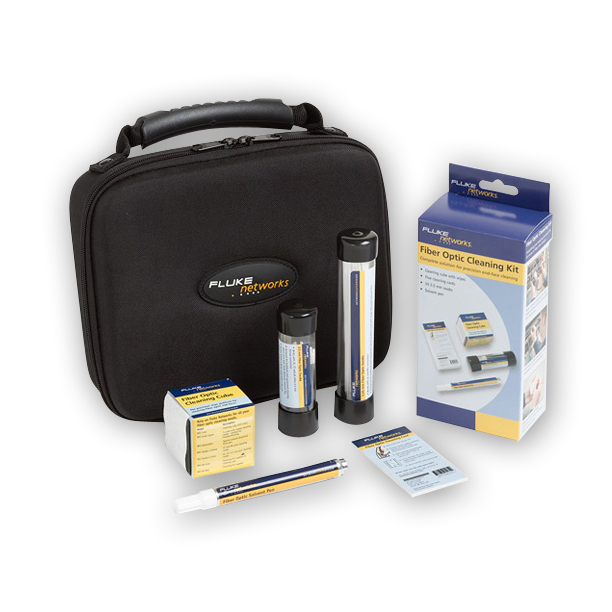 Fluke Networks’ Fiber Optic Cleaning Kits have the best tools to effectively remove the toughest contaminants with ease. Choose between the convenient Cleaning Cards or miniature Cleaning Cube when cleaning patch cords and select the appropriate-sized swabs when cleaning inside ports. All cleaning materials are lint-free and enable an optimal wet and dry cleaning process. 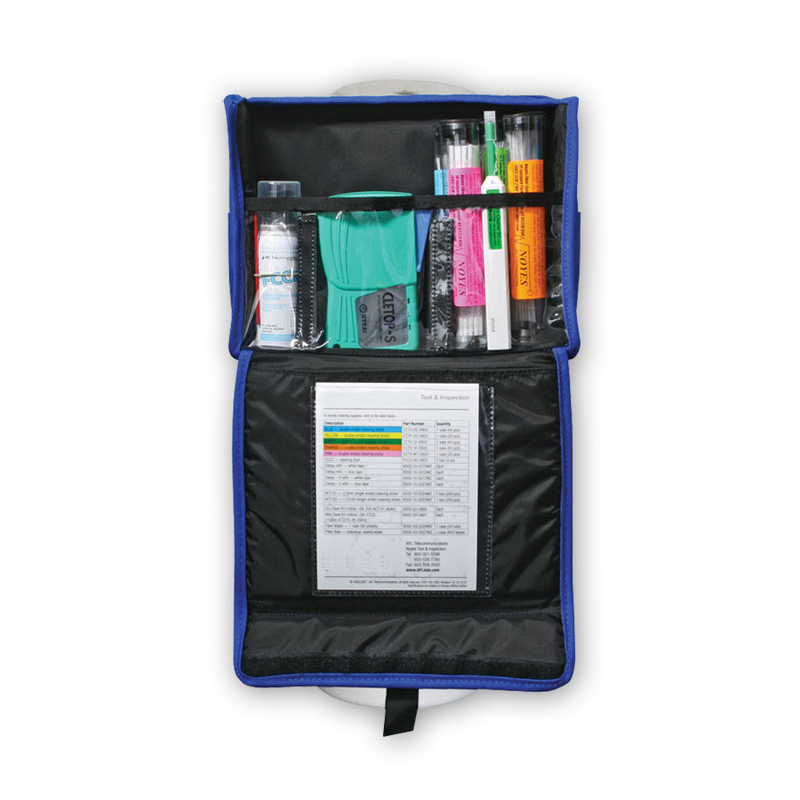 The rugged carrying case is ideal for carrying and storing the cleaning components. Each kit contains detailed cleaning instructions as well as permanently affixed reordering details. An elasticized pouch permits storage of additional items such as patch cords, adapter, etc. 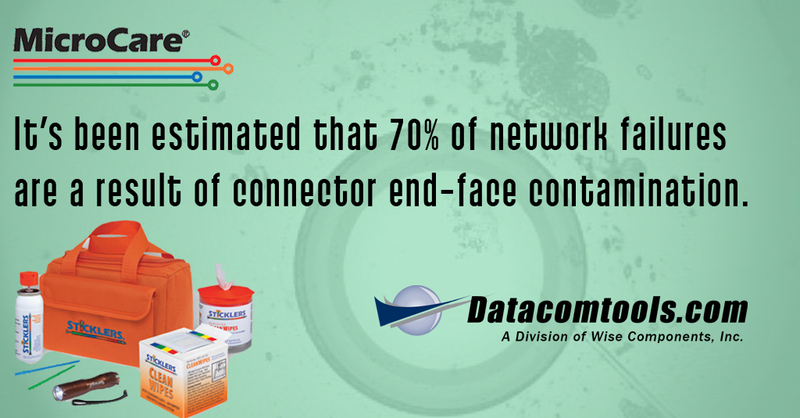 - Contains everything needed to eliminate the #1 cause of fiber link failure: contamination. - All components enable optimal wet and dry cleaning sequence. - Specially-designed fiber solvent is precisely dispensed from pen. - Cleaning cards are perfectly convenient for troubleshooting. - Various swabs are designed to fit many styles of connector ports. - Rugged carrying case stores and transports all cleaning tools. - Use Fluke Networks’ Fiber Optic Cleaning Kits to ensure all fiber end-faces are clean before every mating. ITW Chemtronics has included all the cleaning supplies necessary for a successful fusion splice and 2.5mm fiber optic connection in this convenient kit. Electro-Wash PX Precision Fiber Optic Cleaner and QbE Cleaning System are included for performing the CCp. Swabs and wipes are included for cleaning the fusion splicer and work area. Swabs are also included for cleaning ferrules, alignment sleeves and backplane connections. Electro-Wash MX Premoistened Wipes are included for tool and cable wiping. All the swabs are packaged in rugged tubes for field operations. The kit bags are made from tough nylon for long life. They are equipped with a carabineer to clip on a tool belt for transport or to clip a cable for convenient access. 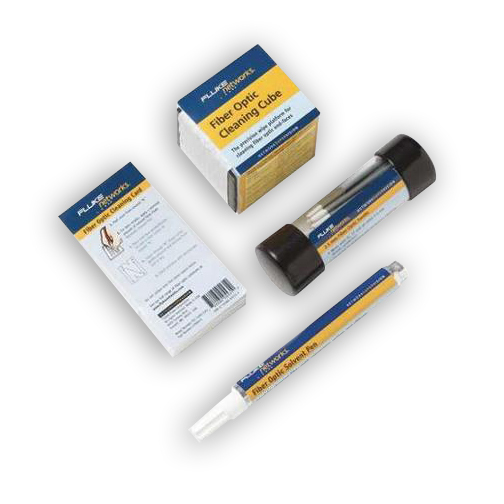 The fiber optic kit for installation and maintenance In the I&M Kit, ITW Chemtronics has included only the cleaning supplies necessary for making a successful 2.5mm fiber optic connection. Electro-Wash PX Precision Fiber Optic Cleaner and QbE Cleaning System are included for performing the CCp. Swabs are also included for cleaning ferrules, alignment sleeves and backplane connections. 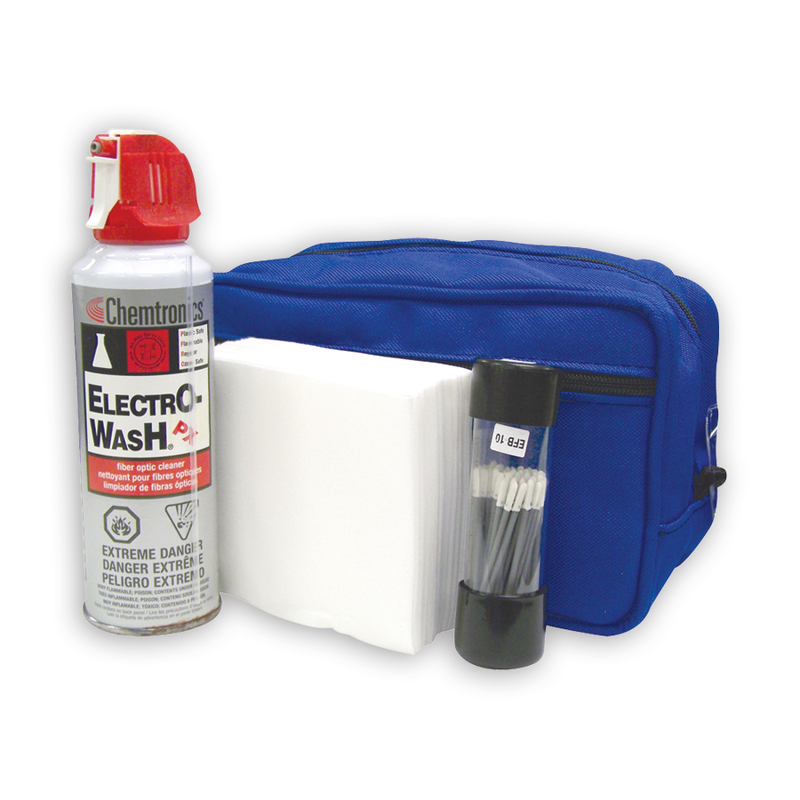 Electro-Wash MX Premoistened Wipes are included for tool and cable wiping. The swabs are packaged in rugged tubes for field operations. The kit bags are made from tough nylon for long life. They are equipped with a carabineer to clip on a tool belt for transport or to clip a cable for convenient access.